Alter the angle of your club face to hit a fade. 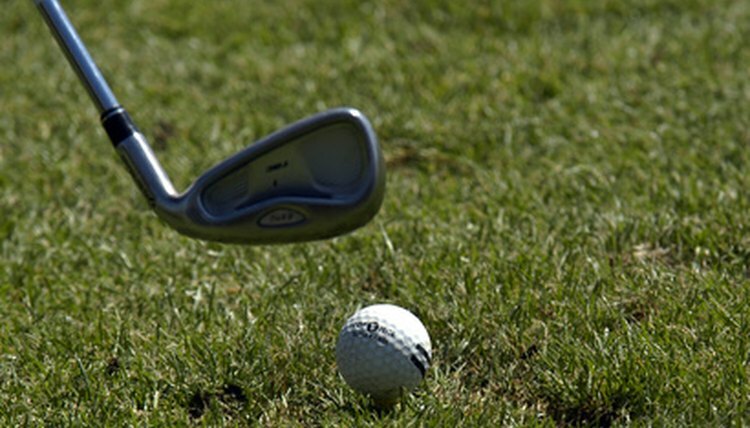 A fade is a specialized shot that moves from right to left for a right-handed golfer. This shot is more controlled than a draw, and it does increase distance like a draw can. You can use a fade to bend around a dog leg, to hit a right side pin location or to shape the ball with or against the wind. Fade shots are hit with specific attention to your swing and body angles. Address the ball with your normal stance and then move your feet 10 degrees to 20 degrees to the left of your target line. This will vary depending on your swing and it can be fine-tuned with practice. Place the ball in the back or middle of your stance, which should be slightly wider than normal. Address the ball and aim your club face at the original target, not at your new target line. This will alter your normal swing by giving your club a different target line than your feet. Press your right arm tighter against your chest during your backswing. This will force your club further behind your body and over your shoulder. Take your normal swing on the ball, moving forward with your weight. Remain in your stance throughout the follow-through.